Working from home means I have to try to work around my kids, and family life. I wrote a post before about ways I manage to work from home with kids. 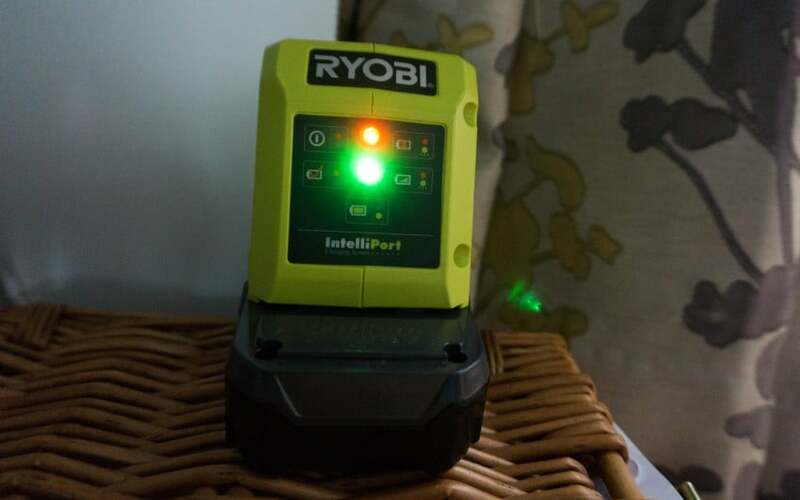 I was sent a Ryobi Drill Kit, which includes 2 batteries, charger, carry case and the cordless hammer drill. We needed a project to use this on, and I knew exactly what I was going to create! I have always wanted a space behind my desk that I could use to add my notes to, reminders, what I had planned, and some motivation quotes to keep me going. As my desk is placed in my lounge/dining room it becomes a complete dumping ground, everyone, including myself dumps stuff on it and it is completely unorganised. As you can see it is so messy, and I find it makes such a difference to my headspace when it gets like this. I struggle to stay focus, and I get frustrated with the mess as it clutters my mind too. 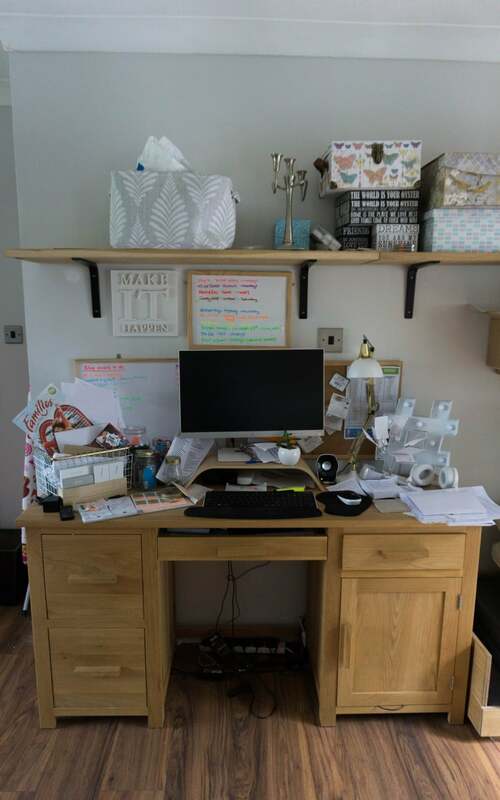 I have my desk directly underneath a long shelf, which we have been using for extra storage, and filling it with lots of rubbish, sorry paperwork and bits bobs!! My lounge had lots of black and chrome in, but I have recently decided to start changing the colour scheme over to gold accents. I have been collecting bits and bobs from high street stores like IKEA. HomeSense and Sainsburys. Gold is quite on trend at the moment, so there is plenty of little bits to choose from. We picked up some MDF, cut it to shape around the shelf brackets, and then started working out where everything went. 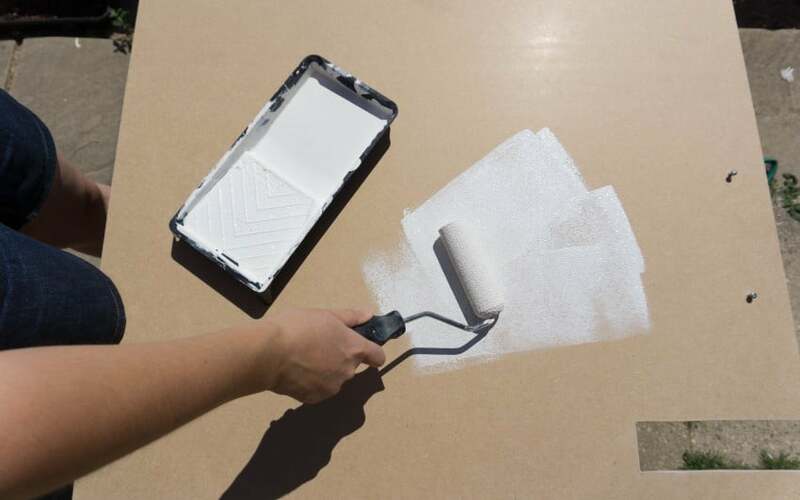 Use a primer, and 2 coats of eggshell paint to create a soft shine. You can use any colour you want, as there is so many to use. I do recommend using a foam roller though, as it gives the paint a nice finish on the MDF. We drilled in screws, and made holes for things to slot in. Make sure you lay everything out, and mark where everything goes before drilling. 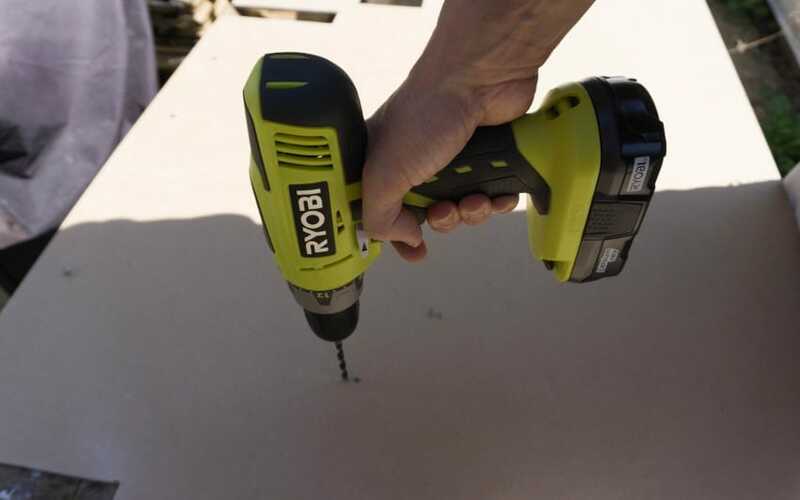 The handy thing with the Ryobi drill is the fact that it is cordless, and comes in a handy little bag. It can easily be stored under the stairs, and quickly used without plugging in. You’re not restricted by where you can drill, or extension cables. I can see me using this as an electric screwdriver around the house!! It comes with 2 batteries, and a charging station, so no worries about never having a battery ready. 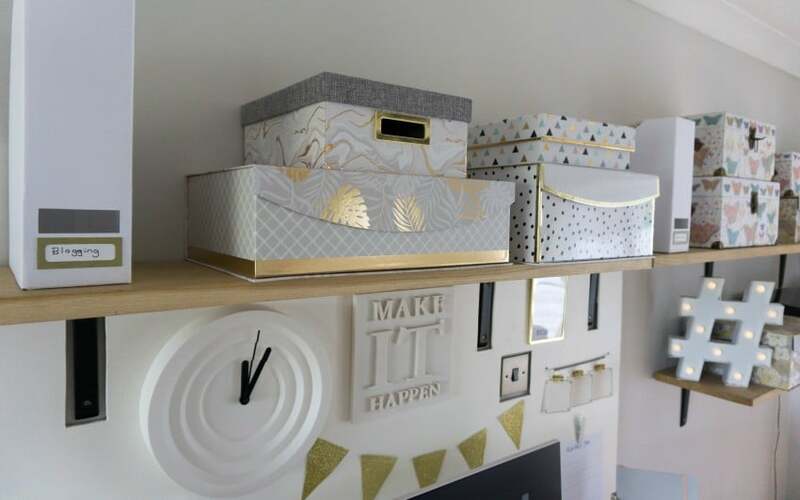 These HomeSense boxes are great to use around the home, you can fill them up with paperwork, camera cables and accessories, and no one knows the messy that is hidden inside them!! I was super chuffed with this light, I’ve been looking for one for a while, and spotted this one in HomeSense and I had to have it! Perfect coloured gold, size and look. 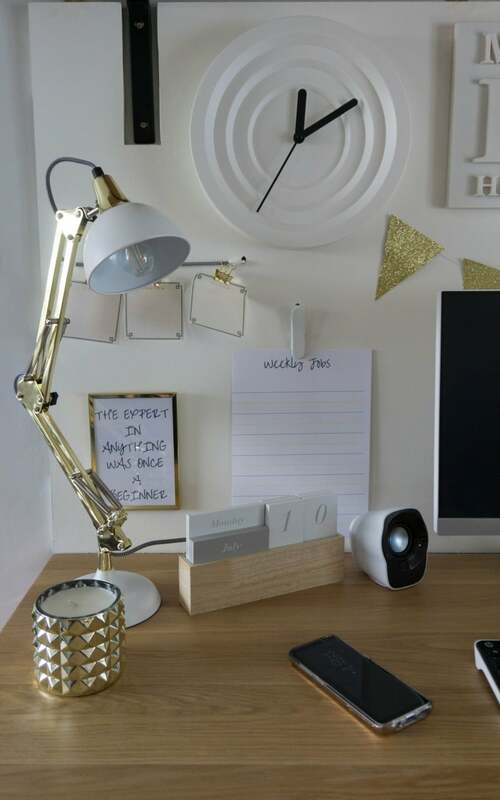 A funky clock to I can keep an eye on the time, I try to block our sections of time to complete a project and having it right there keeps me focused! The pegs, and elastic string are from a new range in IKEA, they are now selling a pegboard which you can hook all these items into easily. However I wanted a board that fitted the area completely, and that I could add things to myself. 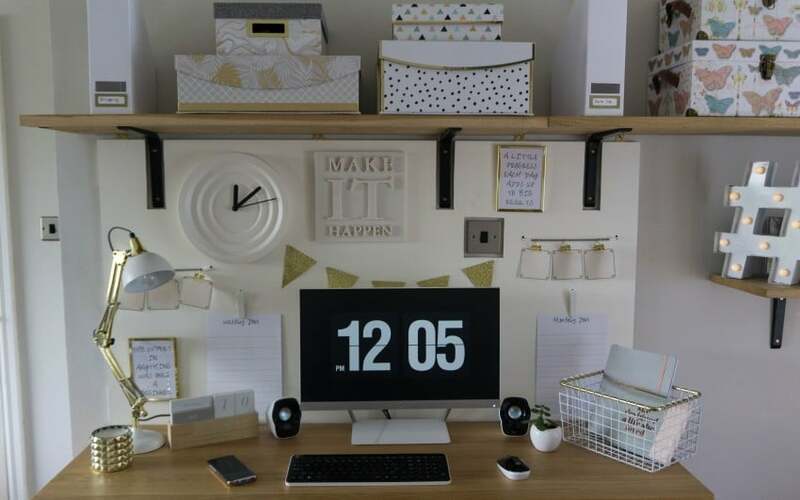 I picked up the wooden calendar from Sainsburys, along with the white and gold basket on the other side of the desk. The little hanging note pads are from HomeSense which I will add blog post ideas, and posts planned. That way I can add to them easily, and take away once completed. I picked up the gold frames from IKEA, and filled with a couple of inspirational quotes. These two quotes mean a lot to me, I always think I should be able to do something, and lose motivation when I don’t understand things. 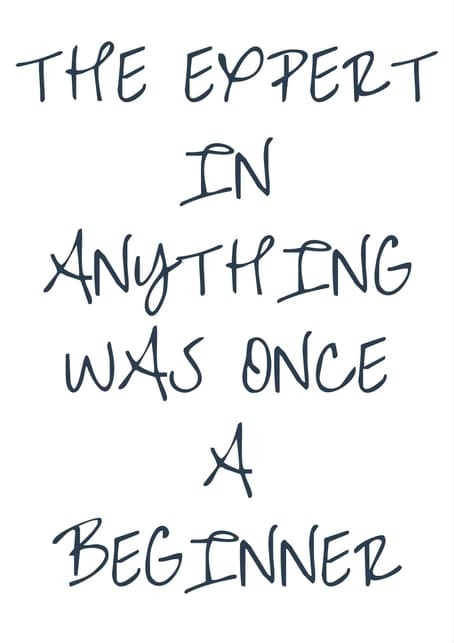 I have to remember that we all have to learn, and we all have to start somewhere. 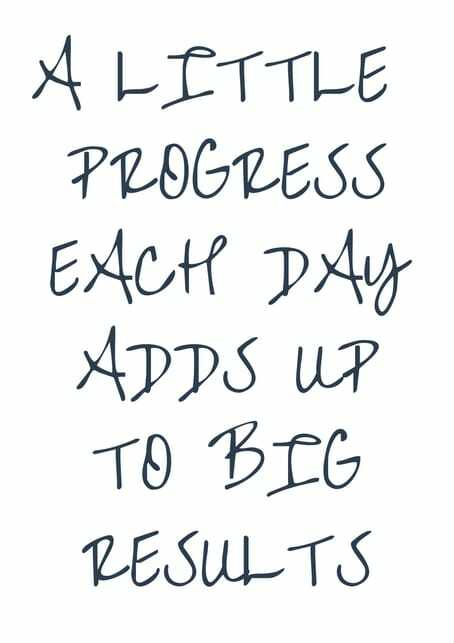 A little bit, and often means you will get there in the end. If you want them to print out, please click through the text to print out. 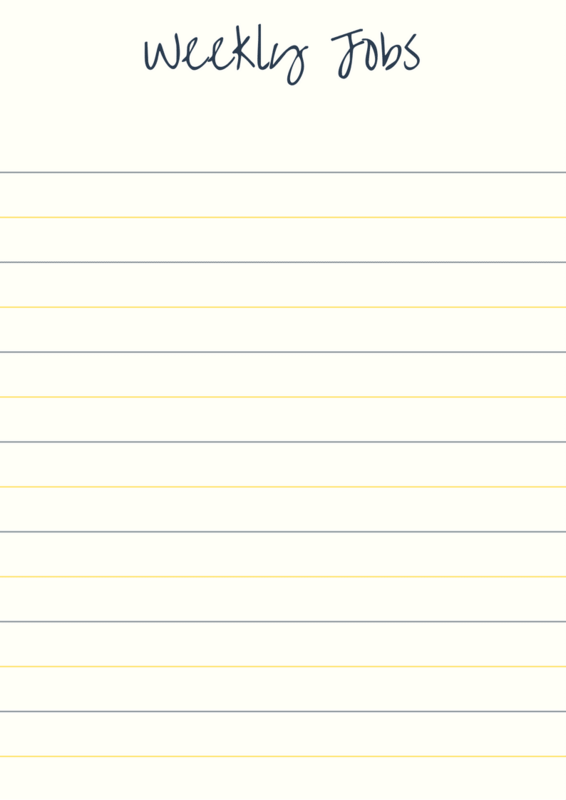 Also a list for Weekly Jobs and Monthly Jobs, I just need to get filling the list now! Gus hasn’t been forgotten, he has his little dog bed that hubby made from 1 pack of wood flooring tucked in the corner, right next to my desk! Just where he likes to be. 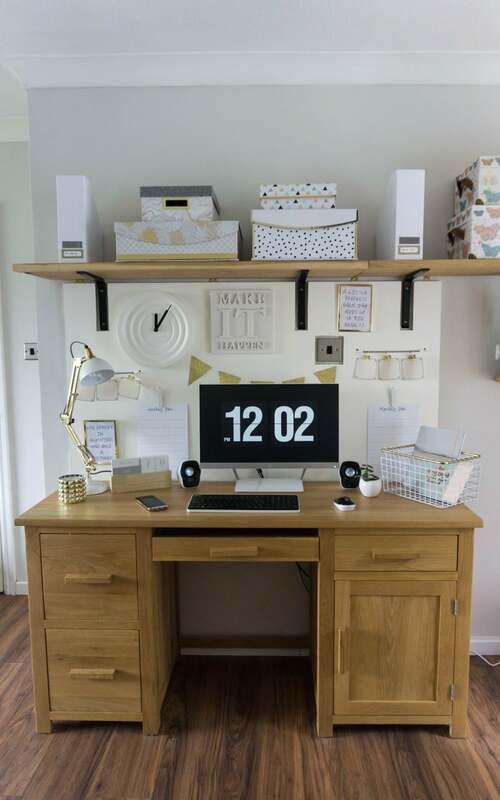 As you can see I have a lovely little set up here now, a space for me to be able to work more efficiently and keep things tidy. As you can see it fits in well with my lounge space, and I feel quite proud of it. It was so simple to create, and I can carry on filling it when I find bits and bobs I love. 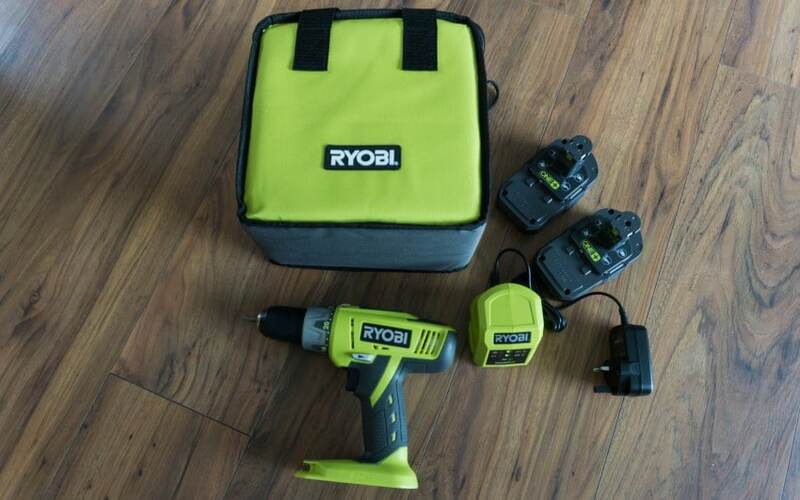 *We were sent the Ryobi Drill Kit for the purpose of this review, however all opinions are honest and of my own. the gold color is very fashionable in this period and gives feelings of well-being !! I love you design. It was so creative and stylish. The home office notice-board is worth having in my office, and even in my own home. I will be applying this one. Thank you for sharing this one with us. 🙂 I appreciate what you did. Great job! Thanks, it is so useful to have, finally can be organised!! This is one of our last jobs, but I love it and well worth tackling it! Super pleased with it, it is nice to have something to look at, rather than a boring wall! I can’t wait to keep adding little bits to it! 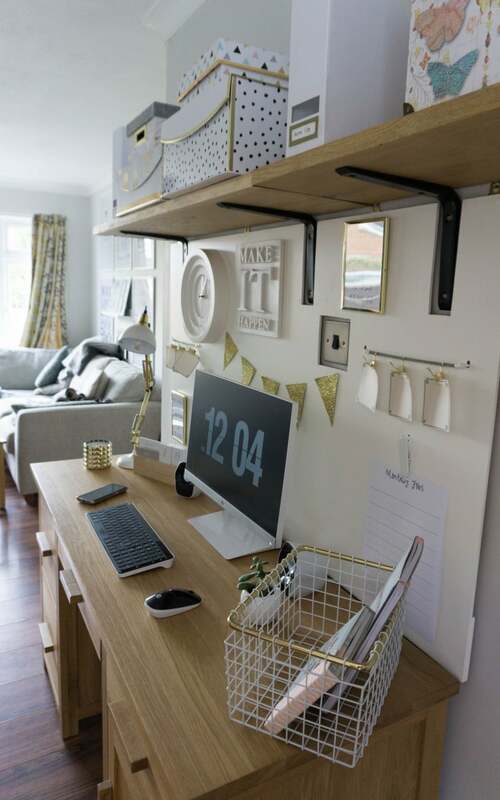 Thanks, great having a space that can be a little organised! What do you think….?! It’s useful clutter…….!! Thank you, now I have to keep it tidy! Wow, what a difference! Love the colour scheme and the way it really works in the room as a whole. And that clock is going on my shopping list! It’s funky isn’t it, although it confused the kids when they tried to tell the time!! They asked to pop the numbers on with a sharpie!! Good plan! Didn’t take too long either, have fun! This is super nifty and it looks so smart and chic! This is definitely a space I would be happy to work in! Thank you, keeping me organised!! Ah thank you, it’s made me much more organised! 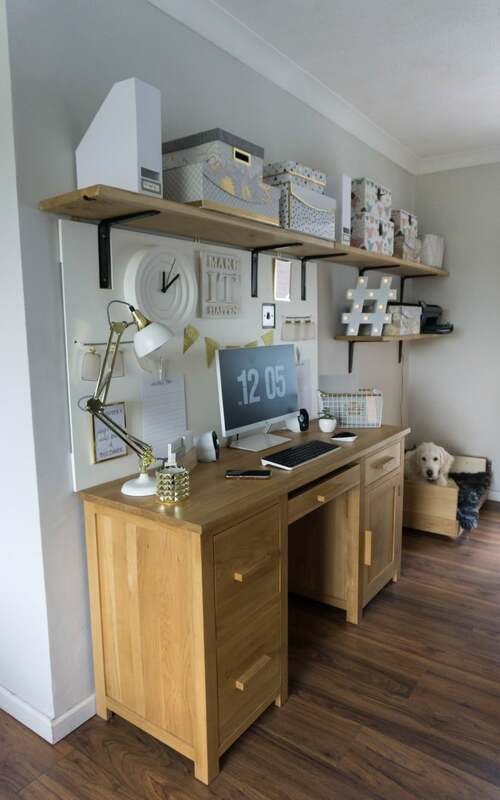 Hope you get your little office space! Thank you, now I have to keep it tidy!! Oh this looks great! You are so talented, I love white and gold together! Ah thank you, I am so glad I can now bring a bit of gold into the house now. That looks amazing! I work so much better when everything is organised. Yeah I do too, my mind feels much clearer and focused. Oh wow! What a difference it’s made! It looks so good now! Great idea! I need to crack out my drill and make a notice board for my living room. Thanks, so easy to do as well! Oooooh this looks so sophisticated! I love the clean cleans and glamour you make it look so easy! Love what you did! White always makes things look so much neater and brighter doesn’t it? Would love to make something like this. My desk is always messy! I have to keep the kids away from it now!! This post could not be more timely. 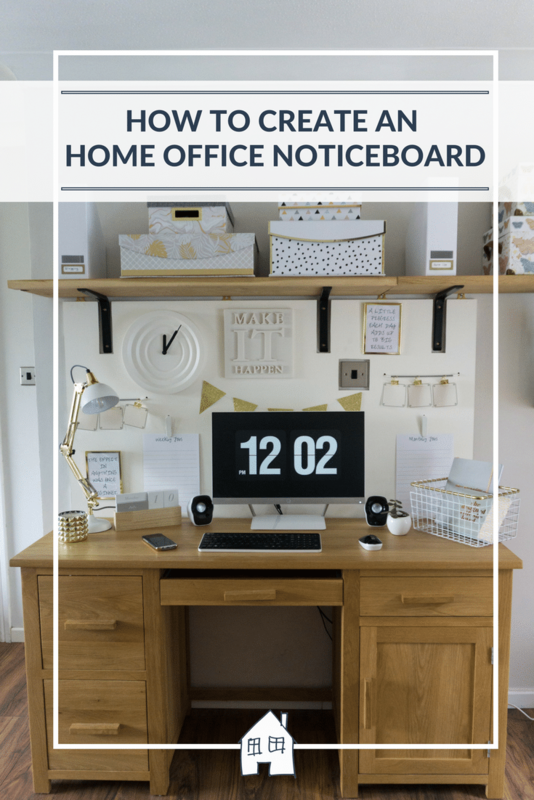 We’re after making a noticeboard in our office so will be follow the guide in this post! Cool, have fun creating it! Great! Looks beautiful.. This is good color combination of gold and white.